In recent weeks, my skin has been pretty dry and dehydrated. This is probably because I've been flying a minimum of two times per week, not to mention feeling super stressed about some upcoming life choices. But, in any case, my skin has been paying the price. Until, of course, I discovered Bliss Triple Oxygen Ex-"Glow"-Sion! Vitabead-Infused Moisture Cream. I suppose it's really no big surprise that my skin immediately responded well to this moisturizer, considering I love each and every product from the Triple Oxygen line. (See here, here and here.) Every product in this line -- not to mention the Triple Oxygen Treatment at Bliss spas -- just makes your skin GLOW. And this new moisturizer is certainly no exception! It contains oxygen, micro-algae, Vitamin E and Vitamin C to bring radiance and a glow to the skin. I love the formulation, which is an almost whipped texture with micro-beads that you massage into the skin. It sinks into skin immediately, leaving behind no greasy residue but creates a gorgeous, youthful gleam. My skin is incredibly sensitive, and I've experienced no redness or irritation. I've tried using this moisturizer both in the morning and at night and, no matter what, my skin just looks and feels incredible. So go ahead, get your glow on. 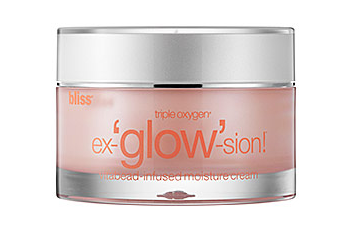 Bliss Triple Oxygen Ex-"Glow"-Sion! Vitabead-Infused Moisture Cream retails for $64 at sephora.com.